A third lava flow from Hawaii’s erupting Kilauea volcano streamed into the ocean on Thursday as US Marine Corps helicopters stood by to evacuate a Big Island community should molten rock or huge cracks block its final escape route. At least 50 rural homes and other structures have been destroyed by lava from fissures in a small area of the Big Island. Some 2,000 people have faced mandatory evacuations and another 2,000 in coastal communities may be forced to leave their homes if State Highway 130, their last exit, becomes blocked. The US Marine Corps deployed two CH-53E Super Stallion helicopters to Hilo, about 24 miles north (39 miles), in support of a task force standing by in case an air evacuation is needed. Each helicopter can carry up to 50 people at a time. Road crews dumped material into cracks on the road and covered them with steel plates in an effort to keep the highway open. Down on the east flank of the volcano, six fissures re-erupted in lava fountains, as volcanic activity moved west towards Highway 130. 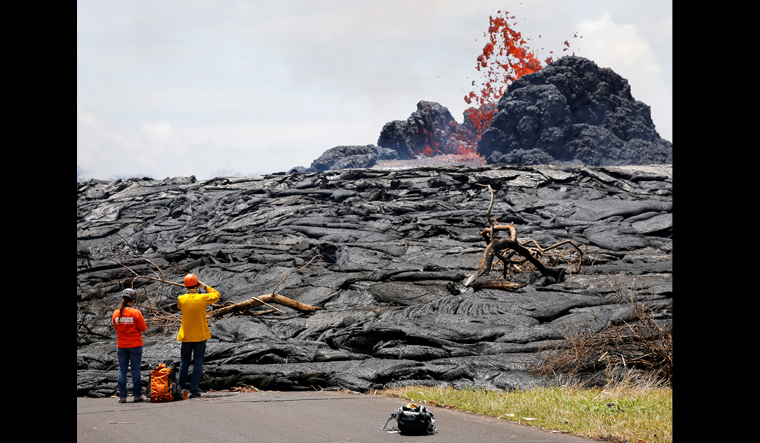 While a roughly 10-square-mile (26-sq-km) area of the Puna district has been ravaged, authorities stressed the eruption was having limited effects on the Connecticut-sized island that is a major tourist destination.